Pray for all the resources and creativity needed to fulfill the intentions of God in the nation of St. Maarten. Background: In 1994, the Kingdom of the Netherlands and France signed the Franco-Dutch treaty on Saint Martin border controls, which allows for joint Franco-Dutch border controls on so-called “risk flights”. After some delay, the treaty was ratified in November 2006 in the Netherlands, and subsequently entered into force on 1 August 2007. Though the treaty is now in force, its provisions are not yet implemented as the working group specified in the treaty is not yet installed. On 10 October 2010, Sint Maarten became a constituent country (Dutch: Land Sint Maarten) within the Kingdom of the Netherlands, making it a constitutional equal partner with Aruba, Curaçao, and the Netherlands proper. Government Type: constituent country of the Kingdom of the Netherlands. 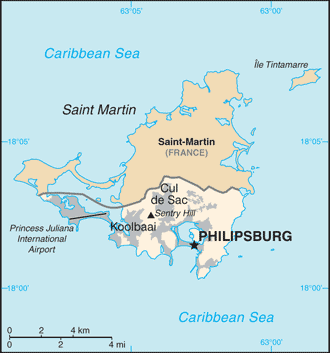 It encompasses the southern half of the Caribbean island of Saint Martin, while the northern half of the island constitutes the French overseas collectivity of Saint-Martin.